You only have yourself to blame, parents. Had you just resisted, and taken the kids to Inside Out again, we wouldn’t be having this discussion. Instead, you had to go and feed those sexless, nattering, product-pushing Minions. And now they’ve got two running franchises. Two! Hope you like the little guys, because they’ll be coming again to a theater—and TV, and toy box, and birthday party—near you, with and without Steve Carell by their side. One scene in the Minions trailer shows the title characters accidentally sending an early master, a fearsome T. Rex, plummeting to his untimely death. It’s like they knew they’d be the one to finally best Jurassic World at the box office. 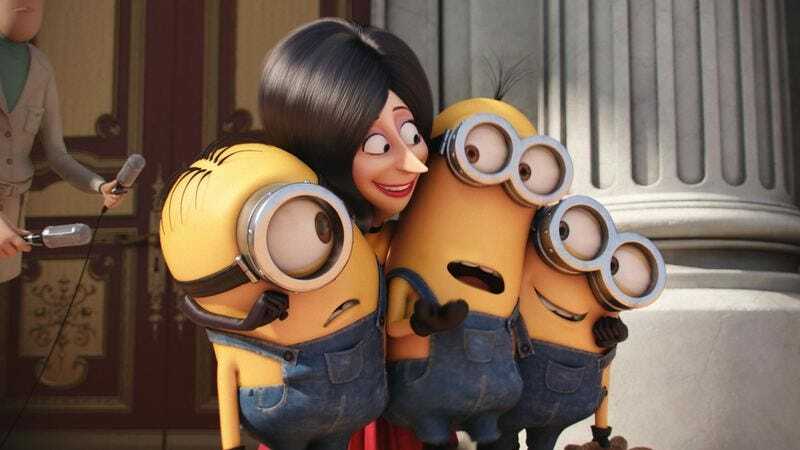 In its fifth week of release, the insanely profitable sequel—now just $40 million or so shy of becoming the third biggest domestic grosser of all time, ahead of the first Avengers—has finally “lost” a weekend. Not that Universal is complaining: The studio released both films, adding to a 2015 winning streak that includes Furious 7 and Fifty Shades Of Grey. Plus, the sudden appearance of a new animated movie helped get Inside Out off Jurassic’s back. It’s been a Lex Luthor kind of year for Universal. Down in fifth place, below that blockbuster trifecta and Arnold’s tepidly received return to the Terminator franchise, is The Gallows, whose $10 million intake was probably enough to cover the film’s undoubtedly miniscule budget. Self/less, the first of two Ryan Reynolds body-swap movies headed for theaters this year, didn’t do as well; its $5.3 million was less than what Focus was expecting from it. On the modest-success front, Magic Mike XXL lost only a quarter of its business in weekend two, rising to a solid $48 million cumulative. Can a Minions-style spinoff about the fat guy who drives the strippermobile be far off?